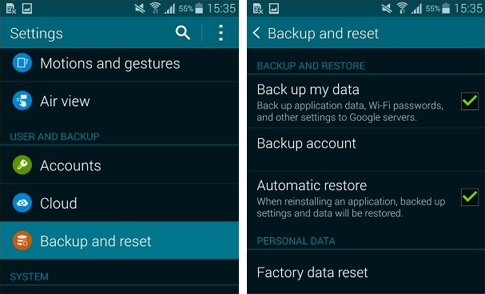 Apps, contacts, music, videos and pictures are among the most important data you need to backup if you're planning to perform Factory Reset on your new Samsung Galaxy S5. Of course, there's always a hassle in backing up things you saved in your phone especially if you've already acquired a lot of them after months of use. In fact, that is actually one of the reasons why many owners refuse to do factory reset. I understand them. I, myself, don't want to go through that hassle that's why I don't save important data in my phones so that when they act up like crazy, I can immediately hit some buttons to reset them. Your phone came with pre-installed apps. These are the ones that cannot be uninstalled as long as you keep the stock firmware on your device. Those you've downloaded from the Google Play Store are considered third-party apps and you can uninstall them anytime you want. When inside the Settings page, scroll down to 'USER AND BACKUP' section. Make sure you are logged in to your Google account and tap Backup account. That's it. Your apps data have already been backed up and you can restore them whenever you want by simply logging in to your Google account. Our main concern here are contacts that are locally stored or saved in your phone. We don't need to worry about contacts that are saved in your Google or Samsung account because unless you lost your access to those accounts, you can access them anytime. There are two ways you can backup contacts that are saved in your phone and that's what I'm going to cite here. From the Home screen, hit Contacts. Choose between Samsung and Google account. Tap OK to begin merging contacts. If you want, you can merge your contacts with both accounts to be sure. The other option is to backup your contacts to your microSD card contained in a .vcf file, which is the universal format for data containing contacts. Once you've exported your data into a .vcf file, you can import them to other phones or your computer. Under the 'APPLICATION' section, find and tap Contacts. Tap Import / Export option. Tap OK to confirm the export. After you hit OK, a message will flash at the top of the screen telling you contacts will be exported. Backing up your files, music, ringtones, videos and pictures that are stored in your phone's storage is easy whether you use a computer or just your phone. Mount your microSD card to your computer if you haven't mounted it yet. Find and tap My Files. Scroll to 'LOCAL STORAGE' section and then tap Device storage. Hit the Menu icon at the top-right corner to expand the drop-down menu. Now locate the folders of files you want to backup. Videos and pictures are usually saved in DCIM folder. Mark the checkbox to the left of files or folders you want to copy. Hit the Menu icon again and choose Copy. You may tap the desired folder you want the files copied and tap Paste here. As long as you have all necessary drivers installed on your PC, the backup process will be just plug-and-play and copy-paste. Using the original USB cable, connect your phone to your computer. If the phone wasn't detected, touch the Status bar and drag it down. Mark the Media device (MTP) check box. A window will pop up on your PC, click Open device to view files. There are two storage devices detected by the computer, Card, which refers to the microSD card, and Phone, the internal storage of your device. It is in the latter that you can find files you want to backup. You can copy them to your computer or to the microSD card. Copy and paste the files you want backed up. When finished, safely disconnect from your PC. If necessary, touch the Status bar and drag it down. On your computer, launch KIES. Once the interface is open, click the Back up / restore tab, then click the Backup tab. Mark the check boxes beside Music, Photo and Select all items. Safely disconnect your phone from your computer when finished. As I mentioned, only data are backed up using the backup method I cited earlier. The apps will be downloaded automatically once you synced your Google account. Depending on the number of apps you backed up and the speed of your internet connection, the restore process may take several minutes to few hours as apps will be downloaded one after the other and their previous settings applied. Log in to your Samsung and/or Google accounts first. Scroll to 'USER AND BACKUP' section, and then tap Backup and reset. Mark the check box next to Automatic restore. That's it! As long as your Galaxy S5 is connected to either Wi-Fi or mobile network and has an active internet connection, everything will be smooth. I cited two Contacts backup methods earlier so I will also cite two ways to restore them based on the same methods I used to back them up. Restoring contacts backed up to either your Google or Samsung account is as easy as backing them up because you just have to log in to your account and turn sync for contacts. Scroll to 'USER AND BACKUP' section, and then tap Accounts. Tap Google or Samsung depending on which account you used to backup your contacts. Mark the Sync contacts check box. To restore your contacts from your SD card, you simply have to follow the same steps as you exported. Tap Import from SD card. The phone will automatically detect .vcf files and import contacts. I cited three different ways to backup your important files: using your SD card, PC and Mac. I will walk you through restoring them back to your phone based on methods I cited to back the up. When you backup data, you copy files from your phone's memory to your microSD card. To restore them, do the opposite. Find and tap My Files, and then All files. Tap the Menu icon and choose Select. Mark the check boxes of files or folders you want to restore. Hit the Menu icon again and this time choose Move. Select Device storage, then tap Move here. All files are saved in the main directory of your phone's storage and from there, you can move them to their designated folders. Navigate to the folder where you saved your files. Select and copy them to the storage device labeled as 'Phone'. Restoring files and data backed up on your Mac using KIES is straightforward. Once the interface is open, click the Back up / restore tab, then click the Restore tab. Having troubles with your phone? Feel free to contact me at harold@droidista.com and I will do my best to help you find a solution. Make sure you provide all necessary information like your phone model, Android version (especially if you suspect your firmware has issues), app in question (for app-specific problems), etc. I receive a lot of emails every single day so I may not be able to respond to your concerns immediately. If you want, you can join the Smartphone Support community I created solely for this purpose. I often stay on that page everyday so there is a big chance you'll catch if you posted your concerns there.